I recently turned 44 years old. And in the last 44 years I’ve had some pretty good birthday celebrations (including epic 21st and 25th birthday parties that I’m still trying to live down). But this birthday was by far the best ever. Kakasii and the older kids, along with our house helpers Anita and Ney, masterminded the whole thing. Max and Elly served as accomplices. Kakasii, Max and Elly got me out of the house about 9:30 Friday morning so the others could launch into action. They made me a birthday cake, cooked some of the American foods they have seen me prepare in the past, even made me iced tea (which Kakasii thinks is the grossest thing ever). When we got back home they were waiting for me, ready to sing Happy Birthday. They had put Kakasii in charge of buying candles for my birthday cake, but told him not to buy those tiny little candles that are for kids. When we celebrated Brenda’s birthday last month, I showed Brenda, Anita and Ney how to make a chocolate cake from scratch. They didn’t have the recipe I used then so found a white cake recipe and estimated just the right amount of cocoa to add to make a chocolate cake for me. I was super impressed, too, because they managed to get the cake out of the tube pan without it falling apart (something I was not able to achieve last month with Brenda’s birthday cake). 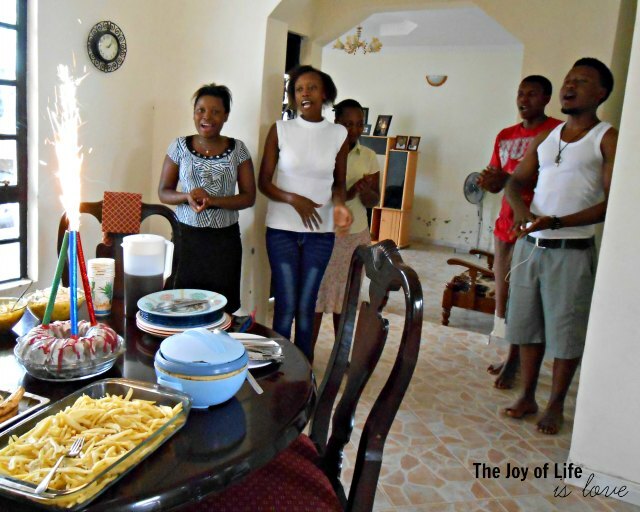 Feeding cake to the honoree at a party is common in Tanzanian culture. Max, however, had no time to involve himself in Tanzanian culture. He wanted to eat cake! 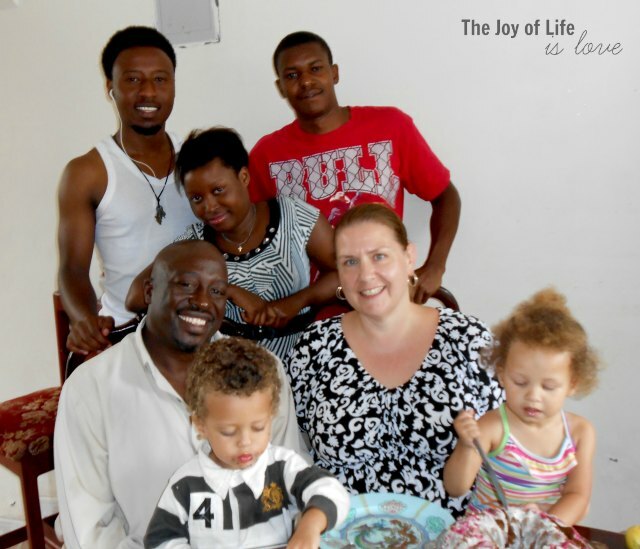 With Ombeni being so far away at university in Iringa, it’s rare for all five of our kids to be together. So this photo sums up why this was my best birthday ever. Could a girl get any luckier than to be surrounded by her fabulous husband and wonderful kids on her birthday? I don’t think so. 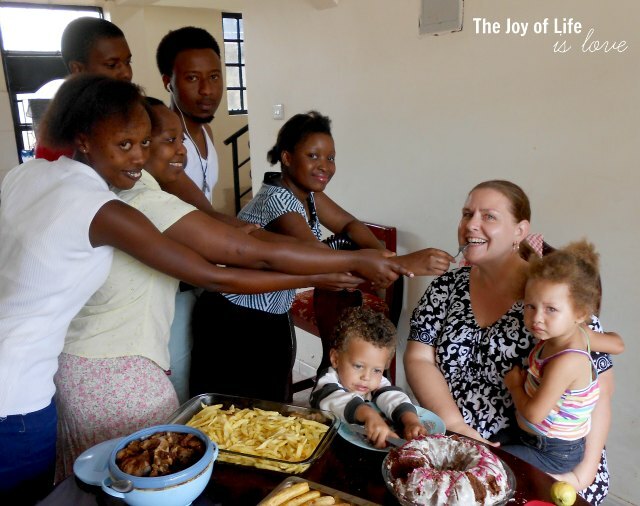 This entry was posted in Family Time, In Our Kitchen, Tanzanian Culture. Bookmark the permalink. 3 Responses to Best. Birthday. Ever.